I strongly dislike corn tortillas that haven’t been fried into chips. The flavor, the texture, the total pain-in-the-assness when it comes to cracking and rolling and splitting. But flour tortillas? LOVE. I am firmly in the “ain’t no enchilada tortilla like a flour tortilla” camp. I might also run the Down With Corn Tortillas SuperPac. But the rules are so lax with those things that I don’t technically have to tell you. Or even myself, really. The exposed ends of the tortillas get crispy and the rest of the tortilla absorbs the enchilada sauce. The absorption factor here is key to what I consider the very best thing about the borderline pain-in-the-assness of making enchiladas: leftovers. And not just any leftovers – leftovers that get better over the next two days and make eating the same thing for lunch and dinner for 3 days NOT a chore. Take all that for what it’s worth. I’m also a big fan of day-old leftover nachos. The smokey, tangy sauce gets its flavors – and a little heat – from roasted hatch chiles, tomatillos, and yogurt (I like to use Greek yogurt simply for the extra protein). 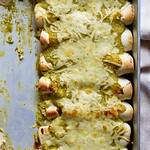 And if you skimp on the sauce when making the enchiladas, you have a pretty fabulously creamy green sauce for dipping. 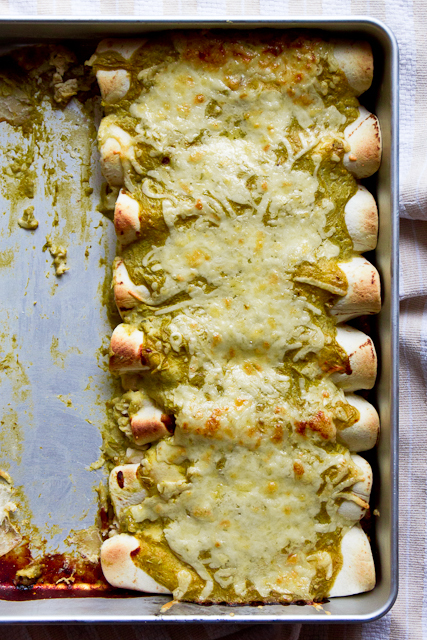 1 hour looks a little time-consuming for a weeknight – and maybe it is – but with leftover chicken and preshred cheese, you’re really looking at 40 minutes of oven time – 20 to roast the tomatillos and garlic, 20 to bake the enchiladas. The sauce takes 2 minutes with a blender or food processor and will beat any bottled green sauce you can get premade. Roasted hatch chiles, tomatillos, and yogurt are the stars in this creamy green enchilada sauce. Line a baking sheet with foil and very lighly spray with oil. Remove the husks from the tomatillos and rinse off the stickiness. Cut tomatillos in half (doesn't matter, but I do a verdical cut down the core) and place cut-side down on the foil along with the unpeeled garlic cloves. Roast for ~20 minutes and remove from oven, leaving the oven on. Set the garlic cloves aside and transfer the tomatillos to a food processor or blender - use a rubber spatula and the moisture from the softened tomatillos to get any browned bits into the blender. Peel the garlic cloves when cool enough to handle and add to the blender along with hatch chiles, lime juice, yogurt, salt, and pepper. To assemble the enchiladas, place 1/2 cup of enchilada sauce into the pan and shake/spread it to completely cover the bottom. Top each tortilla with a generous pinch of shredded chicken and shredded cheese. Roll and place seam-down in the pan. Pour enchilada sauce over top and then sprinkle over the remaining cheese. Bake ~20 minutes, until the cheese is bubbly and browning. Leftovers get even better the next 2 days. I’ve actually found really good corn tortillas that somehow don’t break. Ever. They’re pretty magical. But I totally understand about most of them. No idea how they’re so flimsy! Enchilada leftovers are some of the best you can have. That green sauce sounds slurpable. corn tortillas dont have the gluten that the wheat flour ones do, so they are not elastic like flour. if you want to make corn tortillas easier to deal with (not break in half so easily) heat up a little oil in a pan and warm up each side of corn tortilla for a few seconds, this softens tortilla making it easier to roll into enchiladas or fold for tacos. if you are really short on time or oil you can microwave them covered with a paper towel for a few seconds (like under 30 sec for 10), this will soften them up but they will be more brittle than if you warmed them up in oil. Must. have. These enchiladas look so mouthwatering, Shawnda! I don’t mess with corn tortillas either, especially for enchiladas. These sound incredible! So for those of us who don’t have access to Hatch chiles, what kind of chile would we substitute? If you dip corn tortillas in your sauce or even just rub a little water over each one, they won’t break and will stay moist. Also, if you can find Bueno green chili in the freezer section,(in a tub) it tastes great and saves a lot of time! I used to live in New Mexico, and have found that the frozen Bueno is almost as good as roasting, peeling and seeding Hatch green chiles and So Much Better than canned green chiles. If you warm corn tortillas in a skillet with a little olive oil they become soft and delicious!!! A secret we know to well being from Baja California 🙂 thanx for this dish I’ve perfected it…ps dont forget the cilantro!!! 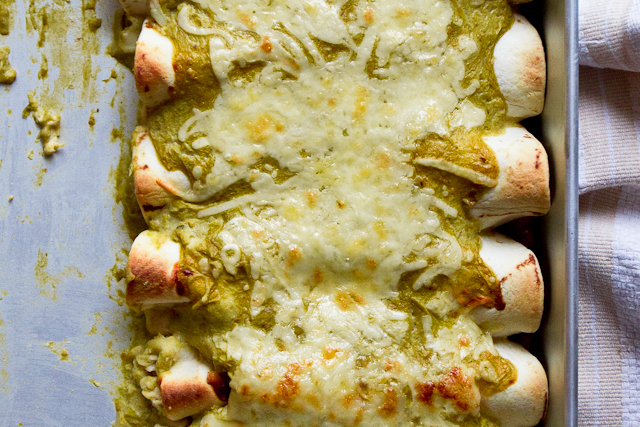 Since I’ve never made homemade enchiladas before and I’m trying to save on time, do you know if these can be made ahead of time? I would like to prepare them tonight but not cook them until tomorrow. Have you tried that? Thank you! Sure. Just wrap the pan tightly and then put the sauce on before baking. So, I made this, but added some kale in with the chicken, and omitted the cheese in each roll (that was an accident) but they came out tasting awesome! The kale was super tender! The sauce was to die for! I think I am going to omit the yogurt and use it as a slow cooker sauce for chicken! Well created recipe all around thanks! I exchanged the yogurt for sour cream, since that was what I already had, and it turned out delicious! I also added an extra lime for a little more zip 🙂 Very good! Can’t wait to try this recipe. I make a similar recipe and substitute cream cheese for the Greek yogurt. If you have trader joes near you they sell jars of hack chili salsa. Great when trying to save time. Just mix the cream cheese or yogurt with the salsa. All good good.